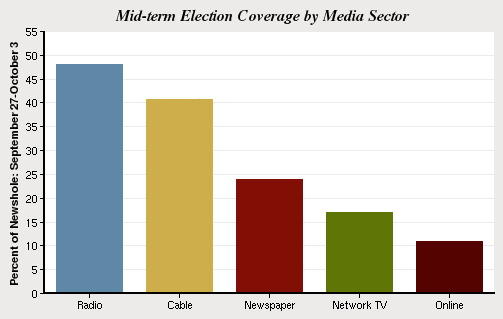 As the president hit the road to shore up the Democrats’ faltering fortunes, the midterm elections topped the news agenda for the third week in a row, accounting for 26% of the newshole from Sept. 27-Oct. 3, according to the Pew Research Center’s Project for Excellence in Journalism. 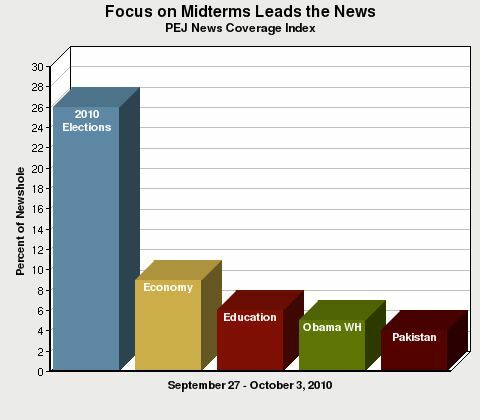 Even though the 2010 campaign did not heat up until the primary campaigns began in earnest in the spring, it is now the third biggest story of the year to date, accounting for 7% of the newshole, according to PEJ’s News Coverage Index. The No. 1 story in 2010 thus far has been the economy (12%), followed by the Gulf of Mexico oil spill (9%). On the ideological radio and cable talk shows last week, a full 69% of the airtime studied was devoted the elections — with hosts finding plenty to talk about as President Obama launched a series of campaign-style appearances around the country. The economy, the No. 2 story last week at 9%, was highlighted in stories related to the housing crisis and a suspension of foreclosures by some big lenders accused of improperly processing paperwork. The No. 3 story last week was the debate over reforming the nation’s education system. The topic, which accounted for 6% of the newshole, got a boost from an education “summit” convened by NBC as well as a call from Obama to lengthen the school year by a month. It was the third week in a row that education, a subject that does not often garner major mainstream coverage, was among the top five stories. Changes in the Obama administration — led by the departure of the controversial chief of staff, Rahm Emanuel, to run for mayor of Chicago — represented the fourth most covered topic, at 5% of the newshole. Rounding out the roster of top stories was news from South Asia. Pakistan, where American soldiers mistakenly killed several Pakistani soldiersin an airstrike, was the No. 5 story, at 4% of the newshole. That was followed closely by the war in Afghanistan, also at 4%, where videotaped interrogations of American soldiers accused of killing civilians attracted renewed attention to the conflict. Continue reading the full report at journalism.org.